I went to Baltimore for New Years and on New Years Eve enjoyed Gruyere mac and cheese with Blue Crab at the Pratt Street Ale House. It was a wonderfully sinful bit of deliciousness to ring out 2012. I didn’t think much about it after that, but then I got some cheeses for Christmas and among the cheeses was a gruyere. I thought about the mac and cheese from New Years Eve and set about to recreate it. Cook pasta as per box instructions. Preheat oven to 325. In a saucepan melt butter add salt, pepper and diced onion – simmer until onion is translucent, add flour and whisk until smooth. Slowly add in milk and bring to a simmer. Remove from heat and gradually add in the gruyere, gouda and blue cheese. 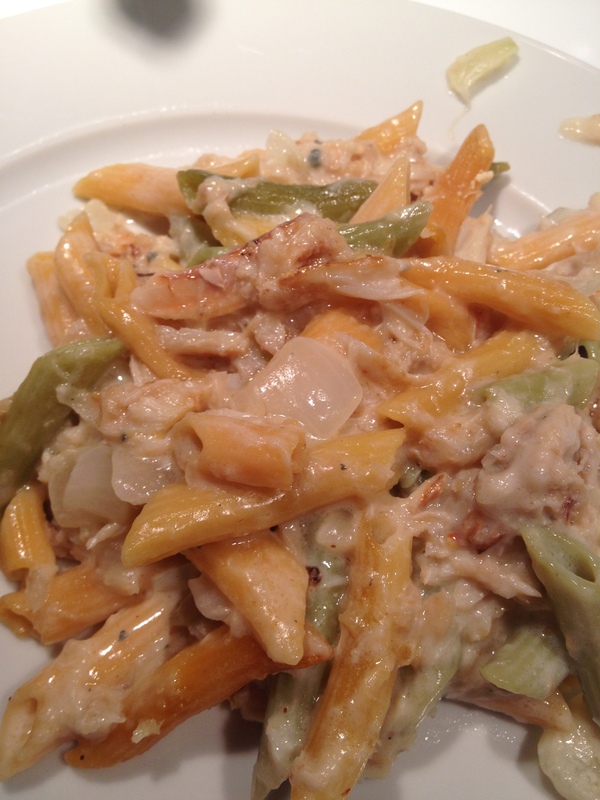 In a greased casserole dish, add pasta, stir in cheese mixture and blue crab – sprinkle the top with parmesean cheese. Bake for about 25 minutes – until bubbling. Serve immediately.